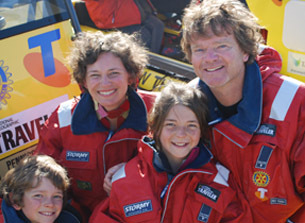 In 2011 Robert Pennicott cirumnavigated Australia in a 5.4m inflatable dinghy with his Operations Manager Mick Souter and cameraman Zorro Gamarnik. It was gruelling 12,000 mile journey that took the trio 101 days to complete. They became the first to circumnavigate Australia in an outboard driven boat. The cost of the trip was funded entirely by Pennicott Wilderness Journeys and sponsors, so every cent donated went directly to the cause. The journey raised $300,000 for conservation and to assist Rotary’s global campaign to eradicate polio from the world. In port towns across the country, the team spoke at media events, Rotary Clubs and public forums to raise funds and awareness. Their journey brought considerable media attention to Rotary’s long-standing campaign to eradicate Polio, reaching a global audience of over 20 million. One month after the trio completed their circumnavigation, the Australian Prime Minister pledged $50 million to the Global Polio Eradication Initiative. We are very close to eradicating a human disease for the second time in history. Global cases have reduced by 99.9% over the last 30 years. Today Polio remains endemic in just three countries – Afghanistan, Nigeria and Pakistan. In 2016 there were only 37 Polio cases reported and there have been just 5 cases reported so far in 2017.